Paul: “Historically Jim Ochowicz who I worked very closely with. Jim was the most professional team manager and he brought in American management styles into European racing. He still acts as an advisor to the Phonak team, which is probably one reason why Tyler Hamilton went to ride for them. Jim is very very straight, and one of the greatest guys that I worked with when I was on the “sporting” side. “Team managers that I respect… would be Giancarlo Ferretti, who is a hard man. And a lot of riders need a hard directeur, it’s like being in the army, you need a General and you need to respect the General. And some riders definitely needed his direction. But that style of management certainly would not suit Lance Armstrong, who needs to be able to make his own decisions with management. So Ferretti is the old fashioned, dominating team manager which would not suit Lance at all, in which case you’ve got to think Johan Bruyneel is a bloody good manager as well, because he is able to act as a manger and advisor to Lance. And Lance seems to need advisors. He knows is own plan at the start of the year, but he needs to put around him a group of advisors. “It’s difficult to say who is the best team manager. Every team manager has his own strong points. 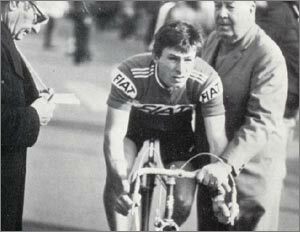 I used to respect Patrick Lefevre an awful lot, and I wondered about some of his decisions vis a vis riders like Vandenbrouke, which is a shame because I’ve known Frank Vandebrouke since he was a kid because I raced with his uncle Jean-Luc. 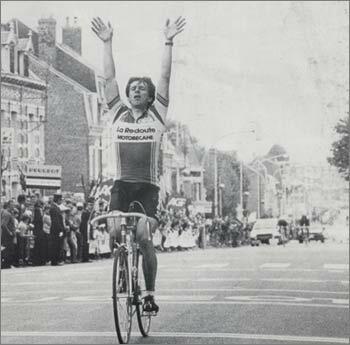 It’ s difficult … To put it into perspective, there’s no way a guy like Jim Ochowicz could ever, with any team he worked with, employ Frank Vandenbrouke. PEZ: Does Vandenbrouke need a “Ferretti" as a team manger? PEZ: How has your background as a rider helped you get to know the riders you report on? PEZ: Are you friends with any of the current pros, do you socialize with them outside racing? Paul: I do stay in contact with some of the old pros, like Sean Yates, Bob Roll, Ron Keifel. But of the English-speaking pros from my era, there weren’t that many. 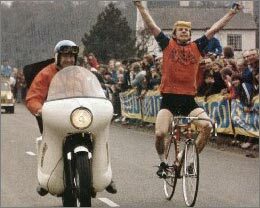 PEZ: What about Robert Millar? Paul: He seems to have vanished. He lived in France during and after his career, but I’m not really sure what he does. PEZ: Okay then, Robert - if you’re reading this please drop us a line and let us know how you’re doing! PEZ: Do you and Phil Liggett socialize outside work? Paul: Oh yeah. I’ve taken Phil on safari. We share a love of wildlife, more particularly birds –Phil is very good on his birds. Phil is as meticulous with his bird watching as he is with his racing results – he actually logged 144 varieties of birds on our last safari. We’re going on safari together to the South Africa in about a week…which is about 4-1/2 hours away by plane! Riders wages are a tough thing to get a bead on, but most of us have wondered how much these guys actually make. I try to steer the conversation around to this sometimes “delicate” topic, but end up blurting out: “ So, uh, mm… at what point in your life did you start to become financially successful? Paul: Phil (Liggett) got me into it. I was retiring from the European scene in1985, to race in England for 2 more years, and Phil asked if I wanted to do the Tour commentary with me? And I said “ yeah, cool!”. PEZ: Did you have any experience in television? Paul: Zippo. Zilch. Nothing. 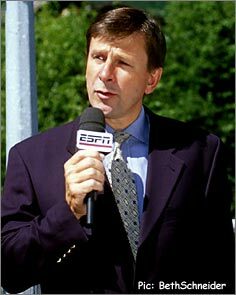 But I was lucky, because Phil and I got on well together, we’d known each other for about 10 years… You could put almost anybody into a commentary position with Phil and he’d get the best out of them. The Tour de France is the biggest tv gig of the year, and I was asked again and again and we developed a rapport…and I really enjoyed the statistical side of the sport, and Phil is very good on the historical side. Together we make a pretty good team…I crapped myself the other day when I realized we’d been working together for 18 years! PEZ: How are you able to spew out so many statistics and tidbits during a race –is all that stuff in your head, or do you have a computer program you use? Paul: A mixture of both really. Phil and I share a database which we put together and update ourselves on a daily basis. We use it to create records of the guys, and now it updates itself automatically when we input new data. But a lot of this stuff is memory. You can’t do a live broadcast without just knowing a lot of this stuff. PEZ: Do you ever get bored? PEZ: What’s your favorite thing about what you do? Paul: My favorite thing about what I do is calling the final 1.5 km of a sprint, when Mario Cipollini’s lining it up with all of his boys. Paul: (haha) no problem… be sure to look us up sometime! PEZ NOTE: Talking to Paul was a real pleasure. He's as laid back in person as he is on tv, and even though it was the first time we talked, the conversation felt like we were old buddies. The interview became less about me asking questions and more of a chat about cycling that just flowed from one interesting story to the next. I hope you enjoyed reading this, and thanks again to Paul for talking to us!